CYFOR are proud to announce that we’ve upgraded our Relativity infrastructure to version 9.6. Our consistent investment in the latest version of the software ensures maximum capabilities in line with client expectations, deadlines and budgets. With the latest in advanced searching and data analytics, machine learning, and visualisations all built in, Relativity is the complete platform for eDiscovery, electronic disclosure and investigations. From Early Case Assessment (ECA) and legal hold through to production, Relativity provides all the tools necessary to review and analyse data around litigation, investigations and a full range of document review challenges. 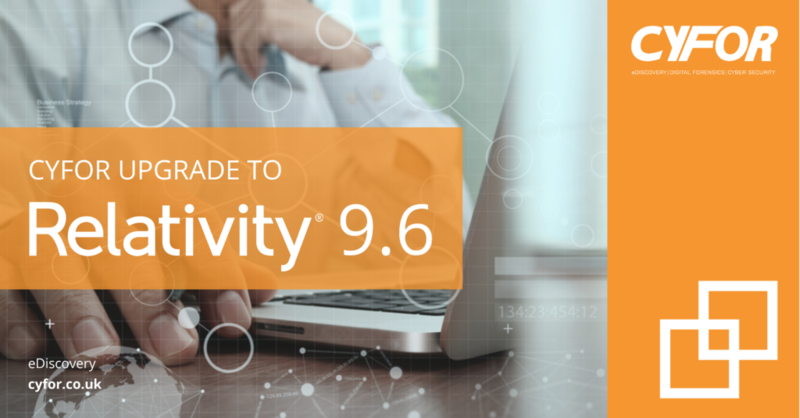 We are extremely excited to be hosting the latest version of Relativity 9.6 to our clients. I know that Active Learning is going to make a huge impact to the way our clients conduct their daily reviews and will greatly assist in time and costs to projects. The team and I would be more than happy to conduct demonstrations of 9.6 and the new features it has to offer, at your convenience. This is the most exciting feature that has been introduced to version 9.6. A new active learning workflow in Relativity Assisted Review gets reviewers eyes on the most important documents faster, with minimal setup and administration required. Active learning analyses coding decisions in real time to continuously learn what’s important to the matter. It then automatically serves up the most relevant documents to the reviewers. They’ll be able to see the hot documents sooner, resulting in a faster review. The new Transcripts application gives users the ability to upload, review, code, and annotate Transcript files in Relativity. This can be done from the front end by the user, without the requirement to send us the data first. New operators are now available for fixed-length, long, and extracted text field types in the advanced search mode. and does not end with. Document Intelligence notifies you that there is hidden or annotated content present in the current document in the viewer. This hidden content is the annotations and modifications tracked in certain document formats. This includes tracked changes, notes and comments within Excel, Word, PowerPoint and PDF. Relativity users now have the capability to upload single files in a drag and drop fashion directly from files stored on their computer, improving efficiency and time management. CYFOR offer complimentary demonstrations to illustrate Relativity’s features within an eDiscovery environment. These are hosted by our senior eDiscovery specialists and cover the core features of the platform, including predictive coding, visual analytics and email threading.